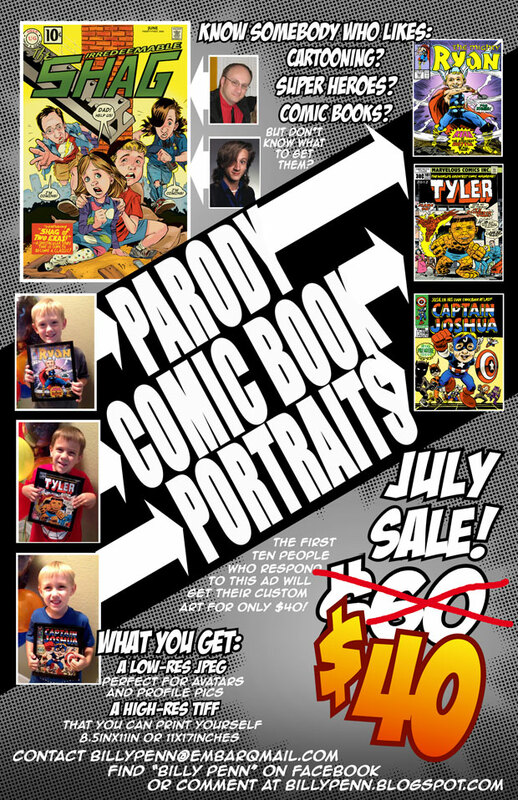 Artist Billy Penn (Hot Shot & Mighty Girl, Savage Dragon) is currently running a special on Parody Comic Book Portraits! Click the advertisement below to enlarge. For Father’s Day 2009, my wife commissioned Billy to draw a parody comic book cover featuring me. Billy created the brilliant homage to Flash #123 (Sept. 1961) you see in the upper left-hand corner of the ad above. For the complete story on that commission, check out the original post on ONCE UPON A GEEK. Billy does amazing work and is super-nice! I highly recommend his parody comic book portraits, whether it’s for yourself or a friend! Oh that’s really cool. Flash of Two Worlds is probably my favorite concept for a cover ever, so that just adds to the awesomeness!